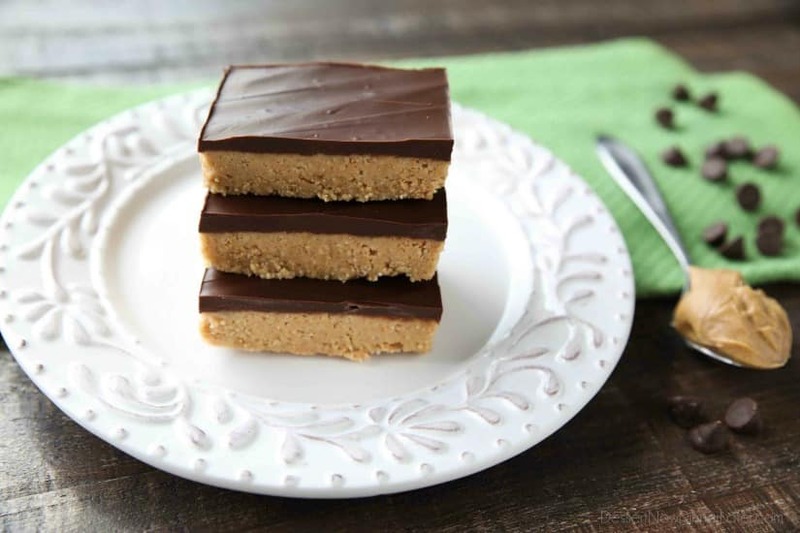 No Bake Peanut Butter Bars - Dessert Now, Dinner Later! 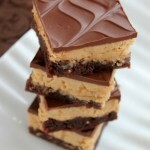 Easy No Bake Peanut Butter Bars taste a lot like a Reese’s Peanut Butter Cup. 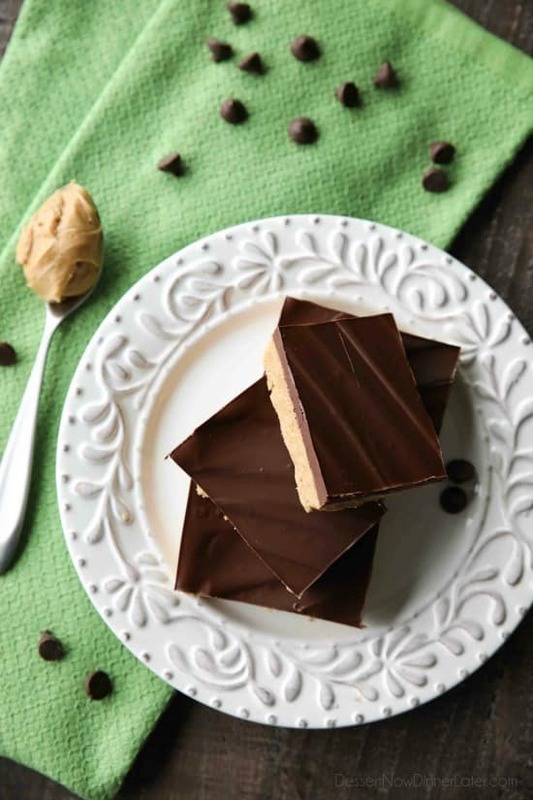 The perfect party pleasing dessert with a sweet and slightly crunchy peanut butter base, and creamy chocolate ganache topping. There are a few flavor combinations that I believe trump them all. Peanut butter and chocolate being one of them. The combination of the two creamy elements is magic in your mouth! 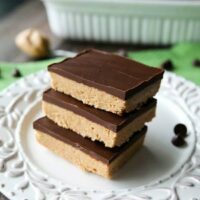 These No Bake Peanut Butter Bars have been on my to-try list for a really long time. Funny enough, a friend brought them to a barbecue we hosted. I’m kicking myself for not trying them sooner! They are actually a lot like my Peanut Butter Pie, but without a crust, and the peanut butter layer is slightly crunchy because of the addition of graham cracker crumbs. I actually really like the substance that the graham cracker crumbs gives these bars. It’s still decadent and creamy for the most part — one square is quite satisfying. 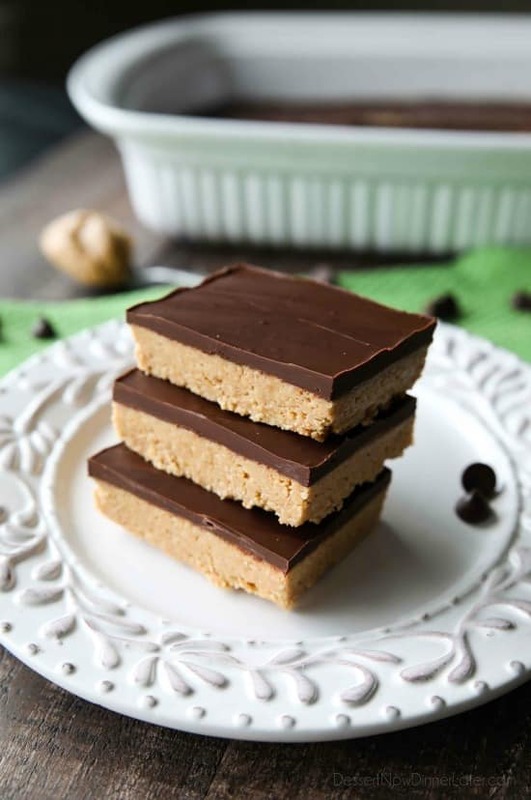 The best part about these No Bake Peanut Butter Bars is that they are SO quick to whip up! They do take a little time in the fridge or freezer to set properly, but you honestly can’t get easier than this! Enjoy my friends! In a large bowl, combine the graham crackers, powdered sugar, and peanut butter. Add the melted butter and mix well. Add up to 1/2 cup more powdered sugar if mixture is too wet. You want it to come together without drying it out. Spread mixture in the bottom of an ungreased 9x13-inch pan. 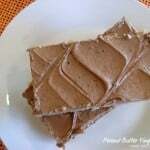 Microwave chocolate chips and peanut butter for 30 seconds. Stir and continue microwaving in 15 second bursts until melted, stirring frequently. Alternately melt with a double broiler. 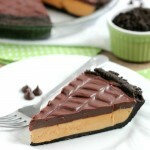 Pour melted chocolate over the peanut butter layer and spread evenly with a spatula. 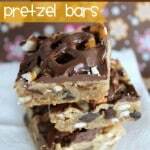 Refrigerate for 30 minutes or freeze for 15 minutes, until chocolate is just barely set. Cut squares. Keep refrigerated. Best served cold. They do melt in the heat and soften in room temperature.